To our valued business partners; it is hard to believe that summer is over as we head into the autumn season. The leaves on the trees are changing their summer look for the beautiful colours of autumn, however we at Häfele are keeping a spring in our step. 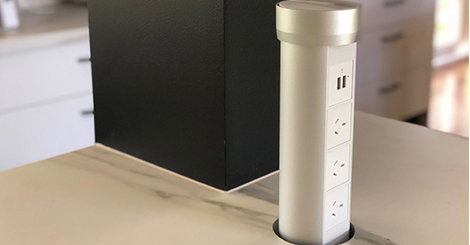 In this edition of the Newsletter we will introduce you to Point Pod, a revolutionary “pop out of the benchtop” power and USB accessory system. A must have in all kitchens. A look into the future with some upcoming events, focussing in the main on the KBDI. Last but not least, further software packages with Solid Setup for Cabinet Vision versions 9 and 11 for our Euro Cargo ST45/60 and our Laundry Carrier 45/60. Marketing: Promotions of the month! We have a very exciting product launch this month: Point Pod! With a simple touch, Point Pod’s power points and USB sockets emerge for use. But unlike other power options, it blends seamlessly into your bench top, so it doesn’t comprise your aesthetics. The units are designed for any space where you would use power on a bench top, including the kitchen, bathroom, office and boardroom. Point Pod comes in two different sizes: Compact and Multi. The Point Pod Compact holds two General Power Outlets (GPO) while the Multi consists of three GPO's and two USB charging units. We are excited to announce that these are available through Häfele exclusively! Check out Point Pod Compact and Multi on our website! Only this month left: Complimentary Screwdriver with every Free Family Fitting order! The fittings of the new Free family give overhead flap doors new freedom in movement. This opens up more opportunities in the visual and technical design of furniture and has tangible benefits compared to hinged doors. It doesn’t matter whether a flap is lifted, tilted, swivelled or folded – it immediately provides added value. And last but not least, more efficiency when working. As the Free Family fittings engineered by Häfele are a very popular product, we have a special promotion for you. For every Free Family Fitting Set order you place between now and the 31st of March 2019, you receive a complimentary tailored screwdriver. We’re pleased to advise software packages for Euro Cargo ST45/60 (Cat. No. 503.70.322 & 503.70.445) and Laundry Carrier 45/60 (Cat. No. 502.72.702 & 502.72.704) are now available from Solid Setup for Cabinet Vision versions 9 and 11. Visit the Solid Setup website to purchase the Euro Cargo and Laundry Carrier software packages, and to view the other packages available for Häfele products. As part of Häfele’s ongoing commitment to the Kitchen and Bathroom Designers Institute (KBDI), we will be co-sponsoring the SA Chapter event on April the 30th in Adelaide. We expect between 80 -100 members to arrive and partake in refreshments while hearing and seeing the latest initiatives from the various companies being represented. This is always a great opportunity to network with kitchen and bathroom designers who don’t necessarily get the opportunity to come to our showroom or be seen by a representative in order to keep up to date with the newest products on offer. Don't forget to make a note in your diary for Interzum 2019 in Cologne from 21st to the 24th of May. Interzum is the world’s leading trade fair for furniture production and interior design held every two years. Häfele represents prominently in this fair and a contingent of Häfele Australia personnel will be attending. We look forward to seeing you there. More on Interzum 2019 in next month's newsletter.